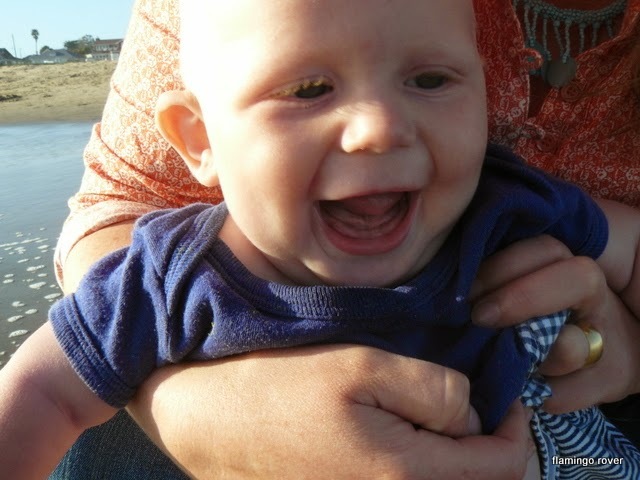 I am looking to collect up travel stories with a twist – travel with babies. Do you think you could be interested in contributing a story, poem, memoir, or travel tale? My concept is still sketchy, but I am ultimately looking to create a book of beautifully written and engaging stories from around the world. Even if the idea of writing a story for print is intimidating – but you have a great tale to tell – do let me know, I am more than happy to do some work-shopping/editing with you. Rafa, in the queue you were your happy smiling self, but by the time we got on the bus something had taken hold. You told us about your unhappiness all the way along the winding farm road. Although we still remember the mutterings of the other passengers, at the time we were mostly concerned for you. What was this red faced distress? The tour guide spoke, but his voice was lost beneath yours: ‘I’m not happy, I’m not happy, I’M NOT HAPPY!’ On a packed and moving bus we quickly ran out of options for comforting you, and resorted to the old reliable – a mummy cuddle. It did not help. Blessedly the bus ride was short, but your unhappiness continued in the open air. Your mummy hovered at the back of the group with you screaming in your harness. People with children murmured sympathetically; people without children congratulated themselves. The white muslin draped over your head to block out the March sun did nothing to muffle your distress. All around us lay fields touched by the long New Zealand summer, but where we in a green bower. Quite likely the tour guide was explaining why, but we did not hear him. Bees may have buzzed happily in this innocent, happy land, but we did not hear them. Slowly, slowly you quietened, moving from slow grizzles to restlessness and finally a hiccupy sleep. Luckily this was in the days when you were not so big your mummy couldn’t carry you, and so up hill and down dale we went at last, exploring Hobbiton. 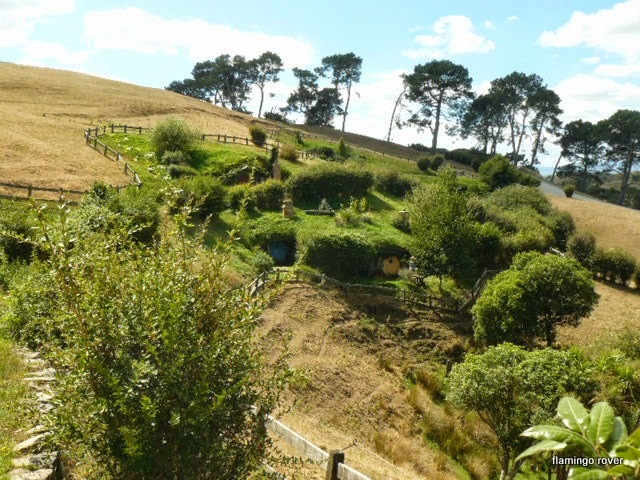 On our way to Lake Taupo for the weekend I happened to spy that Hobbiton was only a small detour. The most expensive single touristy thing either of us had ever done – and it started with the you screaming the place down. Movie buffs, book geeks, yes and yes we were; obsessive know it all’s who constantly need to prove their extensive knowledge of Elvish, Entish, lost kings, and Orcs – we left that for others in the group. I read and imagined Tolkein as a young woman in Australia, but now I live in the land of its authorship, and am getting to know the landscapes in which the author imagined his world into being. 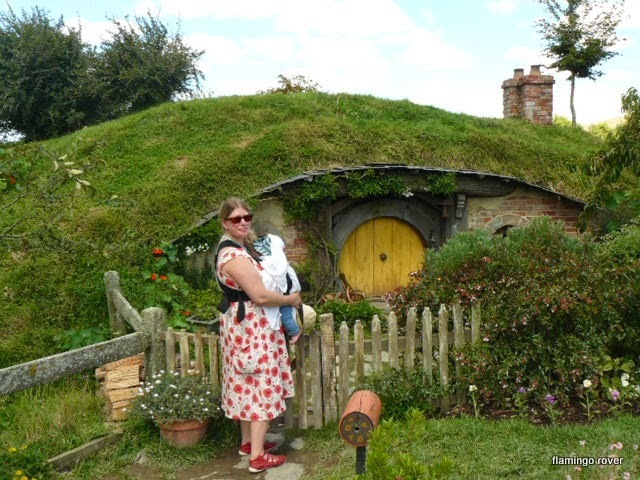 In New Zealand we stepped into Peter Jackson’s imaginings of The Shire and spent a happy afternoon wandering about with a quiet bub, peering at Hobbit holes, listening, at last, to the guides stories, and having a quiet ale at the Green Dragon. Sleepy Rafa and Rover mum outside a Hobbit hole. And the reason for this distress, we discovered later that day – your first tooth, peaking out of some angry gums. A big deal indeed. Rightly causing you to be upset. But Rafa, this tooth, and those that follow are the doorway to new worlds – chewing and biting new tasty foods. We look forward to sharing so many new things with you. Tasty lunches, second breakfasts and stories of brave young Hobbits.